Vijay Devarakonda won accolades for his acting in Pelli Choopulu and he proved his commercial stamina with his last outing Arjun Reddy. Right now, he is busy with his upcoming film “Taxiwala”. Tollywood top production houses GA 2 and UV Pictures, which both has good taste in making meaningful films, are producing the film jointly. SKN is foraying into production with the film which marks directorial debut for Rahul Sankrithyan. Taxiwala is going to be a milestone film in Vijay’s career. Currently, post production works are happening. Producers have announced to release the movie worldwide grandly on May 18th. Meanwhile, they have released first look poster of the film, besides unveiling a small video of the film billed to be a science fiction thriller. The film unit is overwhelmed with immense response for the video. While speaking on the occasion, producers said, “It may not be mentioned specifically about Vijay Devarakonda's current craze and popularity. Likewise, director Rahul took special care in designing Vijay’s character to please all section of audiences. Vijay’s mannerisms, body language and characterization will mesmerize the audience. Director Rahul’s taking, Sujith’s visuals, Jakes music, Krishnakanth lyrics, Jashua’s stunts are going to be major highlights in Taxiwala. At present the film is in post-production stages. 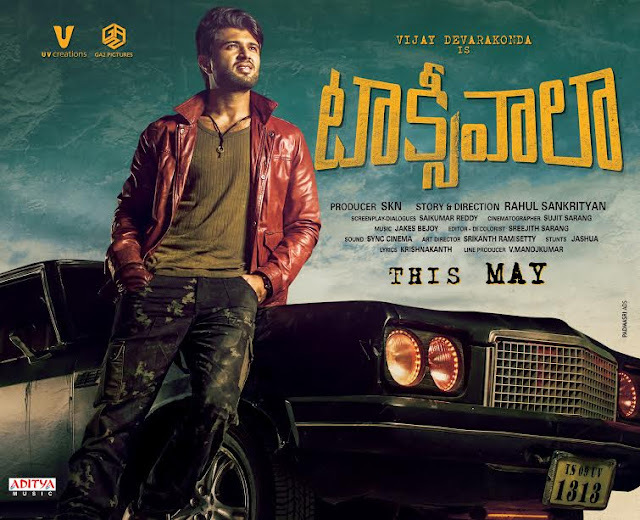 We are planning to release Taxiwala grandly worldwide on May 18th. Before releasing first look poster, we released a video to reveal title of the film. It got excellent response. Today, we have released first look poster." Cast: Vijay Deverakonda, Priyanka Jawalkar, Malavika Nair, Kalyani, Madhunandan, Sijju Menon, Ravi Prakash, Ravi Varma, Uttej, Vishnu etc.